Learning about animal movements sure inspires some amazing writing. 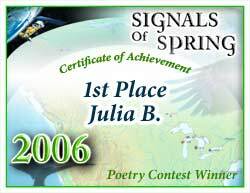 Signals of Spring students in Grades 6-8 submitted 200 poems this season, the most ever! From flight to conservation, food finding to rehabilitation, Signals poets from across the country tackled a variety of topics related to this spring's migration. With so many great entries, the judges' decisions were tough! Congratulations to all of the 2006 winnersincluding honorable mentions for each participating school. The first, second and third place poems are featured below. What if this night is their last? Everything silenced, from the swamps to the oceans. Nature is silenced, for lack of concern. And once it's gone; it's gone. For nature we depend on, creatures in all. We rise together, and together we fall. Actions of a species affect one another. Such as our building, others' homes we smother. Learning from our mistakes, effecting the vast. Preserving the species we mustn't stall. For thousands of species, extinction; their fate. Carelessness acting as the final knife. We know what should change, a chance, we can't miss. We rise together; and together we fall. Americas' Freedom... "The Bald Eagle"
on a windy Spring day. in the cold blue water. representing America's freedom, he stands. 1 hour and 24 minutes a day. you soar to sections of Colorado. We track you where you migrate. We find our what you eat. and weather you are living. I take a leap of faith and gracefully fall out of my nest onto the damp, warm earth. No, this isn't my nest. Look down at my bent wing wait& what is that on my wing? It seems to make the pain go away, I'm happy, so I'll worry about it later. I have gotten used to this routine. When I am not trying to fly I am resting. My wing is mended and now I wish to hunt more then ever.